Studies recently found that kids in some New York City public schools drank water almost three times more often after water dispensers were installed near their lunch lines. The author of the study said that the water jets made it easier for kids to get their water, and made it more “fun” for younger kids because it allowed them to fill their own cup. One of the goals of this study was to make drinking water more easily accessible for kids by placing the water dispensers in school cafeterias. While kids ate their lunches they saw the clear plastic water jugs in plain site and were reminded to drink more. As we know, there are many other drinks for sale in school cafeterias today, and drinking water isn’t really the “cool” thing to do, so it’s not always a kid’s first choice. 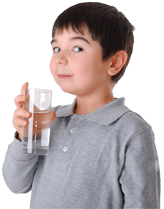 We all know the health benefits of drinking water, but for kids it’s especially important for replacing high-calorie sugar drinks, which may lead to obesity and cavities. Kids are more likely to lose water during activity because of their size and might be less aware of their thirst than adults. FriendsofWater says well done for helping more kids to drink more water. The next step however, would be to provide clean, filtered water. Though it is healthy to drink water, most water today is treated and could use a lot of filtration. We want our kids to drink pure water!